DiscountApp is a browser add-on that is aimed at providing you with free online coupons and special offers so that you can save your time and money. The program is compatible with Internet Explorer, Google Chrome, and Mozilla Firefox, and is promoted at discountapp.co, which does not contain any download manager at the moment of writing. The odds are that the official website is just an attempt to make you think that the program is reliable, which should not be disregarded. Technically, DiscountApp can be bundled with free programs, and, if you want to prevent programs such as DiscountApp in the future, you should be very attentive when dealing with the setup files of freeware. It is highly advisable to review the license agreement provided to you so that you can decide whether you really want to install a particular program. DiscountApp is programmed to display a range of advertisements, including pop-ups, in-line advertisements, coupons, and web banners. DiscountApp advertisements are displayed on Walmart, Best Buy, Target, and many other famous websites, but you should keep in mind that they are owned by third-parties. The developers of the browser add-on do not monitor and endorse those websites; moreover, those third-party websites to which you are taken by DiscountApp are governed by separate privacy policies. By installing the browser add-on, you agree to be provided with third-party advertisements and accept responsibility for your interaction with those third-parties. 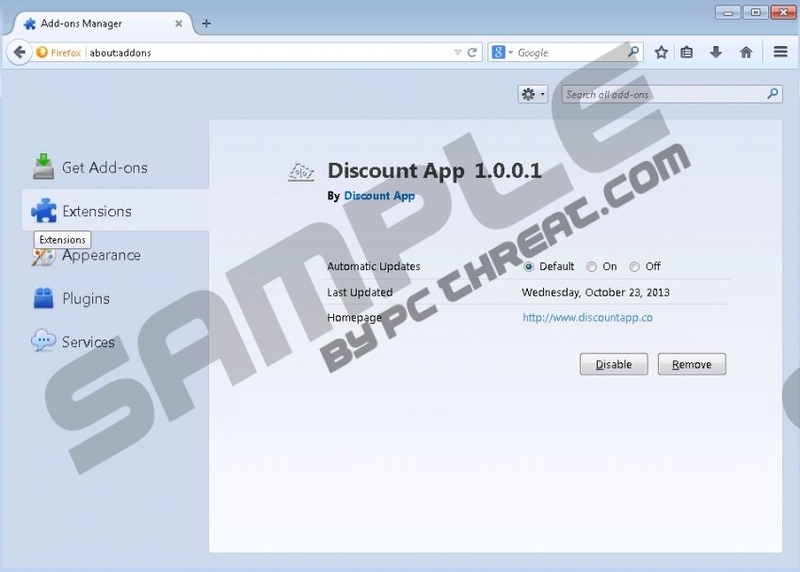 If you want to bypass insecure websites and be sure on the Internet, you should remove DiscountApp using a reputable spyware and malware removal tool. It is possible to remove DiscountApp manually, i.e. by uninstalling the program, but it is much better to rely on an anti-malware program so that you can be sure that all malicious files are eliminated from the computer. We recommend using SpyHunter because this real-time spyware and malware prevention program can remove DiscountApp and safeguard the system against multiple Internet-based threats. Select Uninstall a program and remove DiscountApp. In order to be sure that you can safely use the Internet, you should install a powerful scanner as soon as you uninstall DiscountApp. Click the download button below to download our recommended scanner and invest in the program if need be. Quick & tested solution for DiscountApp removal.